Abstract. A common aim of epidemiological research is to assess the association between a particular exposure and a particular outcome, controlling for a set of additional covariates. This is often done by using a regression model for the outcome, conditional on exposure and covariates. A commonly used class of models is the generalized linear models. The model parameters are typically estimated through maximum likelihood. If the model is correct, then the maximum likelihood estimator is consistent but may otherwise be inconsistent. Recently, a new class of estimators known as doubly robust estimators has been proposed. These estimators use two regression models, one for the outcome and one for the exposure, and are consistent if either model is correct, not necessarily both. Thus doubly robust estimators give the analyst two chances instead of only one to make valid inference. 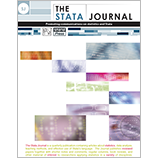 In this article, we describe a new Stata command, drglm, that implements the most common doubly robust estimators for generalized linear models.